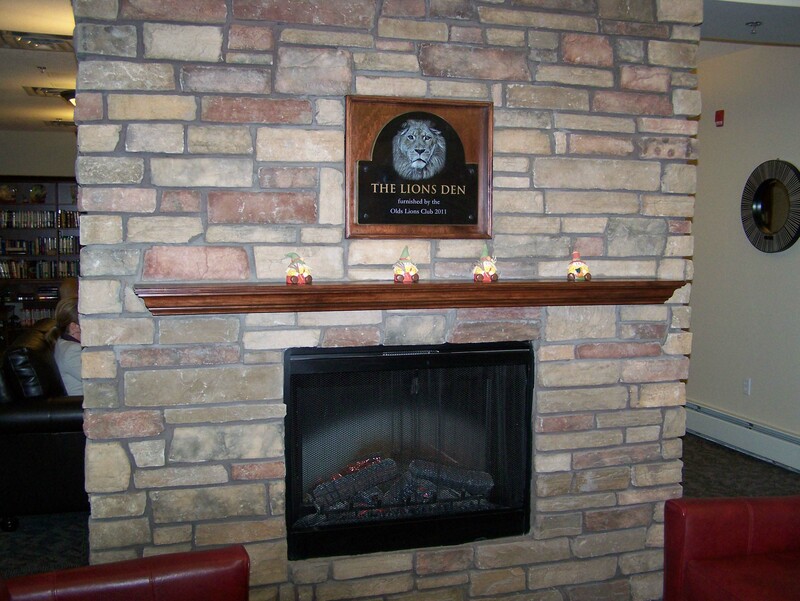 In October of 2012 the Olds Lions Club donated $72,000.00 for the furnishing of the entertainment room of the new Olds Seniors Lodge. With this donation we were able to call the room 'The Lions Den'. 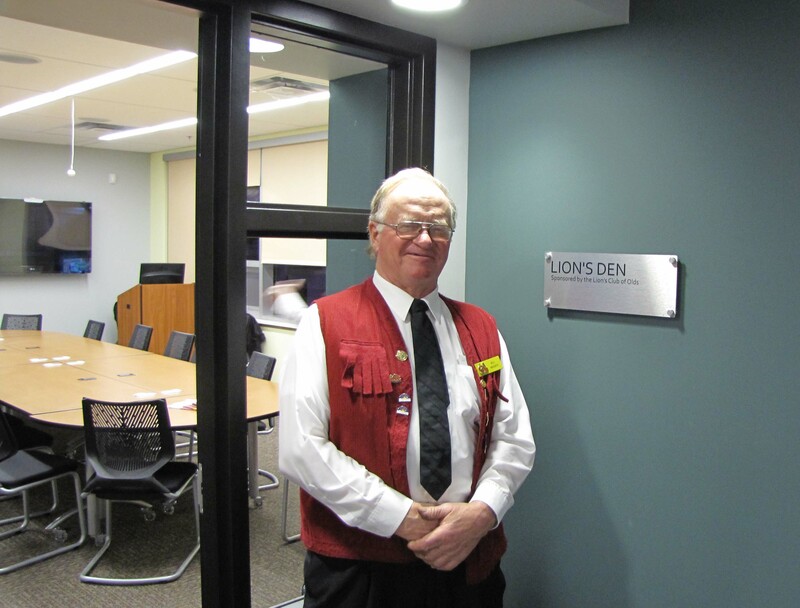 This is the second 'Lions Den' we have sponsored in Olds. 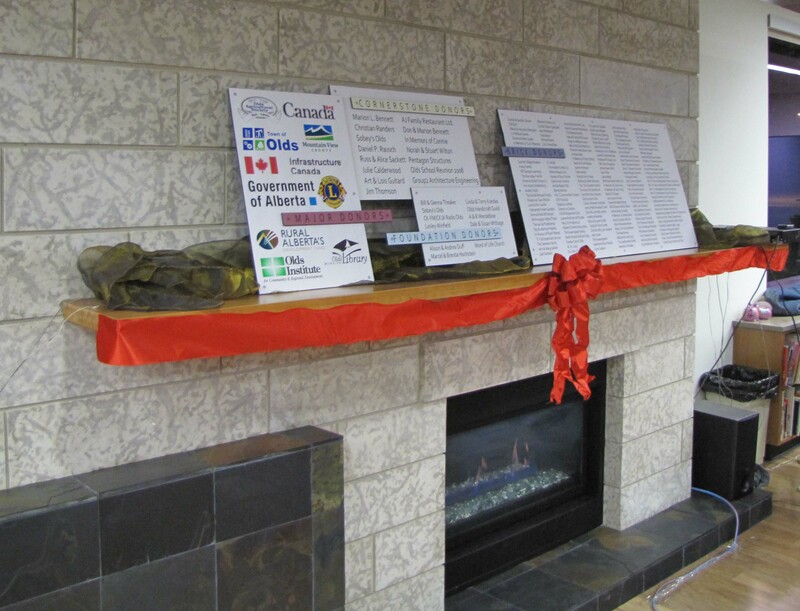 The first was the teleconference room of the new Olds Municipal Library to which an $80,000.00 donation was given towards the building of the library. 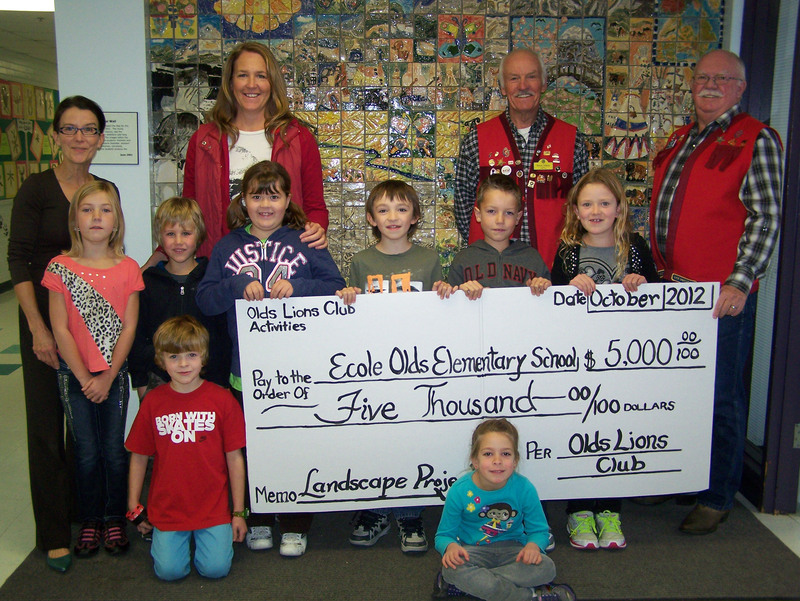 Lion President Bob Ellingson (on right) and Lion Dennis Wilkins (centre) present $5,000.00 to the Olds Ecole Elementary school for their green project which will be a showcase infront of their school. This project was planned by the children in the school. Further to this the Olds Lions Club has donated $6,000.00 to Olds Minor Hockey for the purchase of home and away jersies for two girls teams. 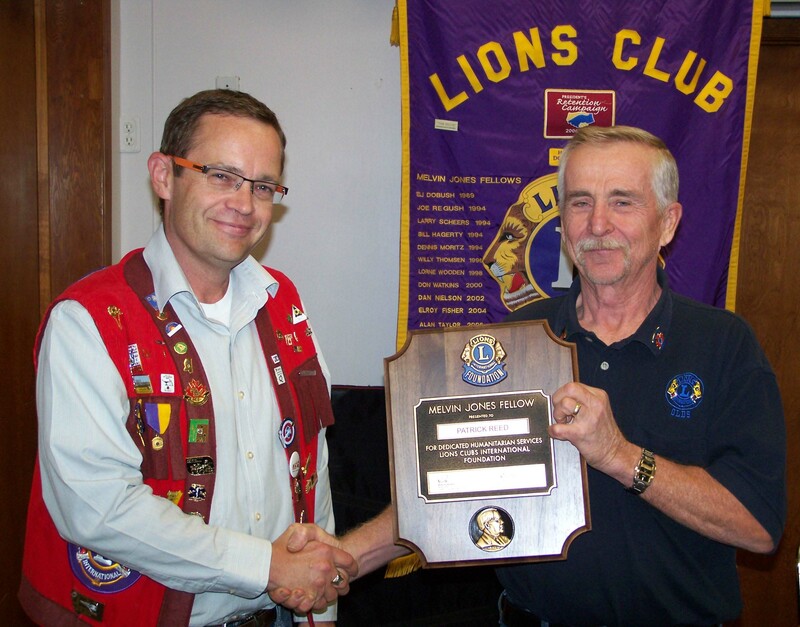 After many years of dedicated service to Lionism, Lion Pat Reed (on left) was presented with a Melvin Jones Fellowship to recognize that service. The Fellowship was presented by Past President Ray Adair. Congratulations Lion Pat on your award. You earned it. 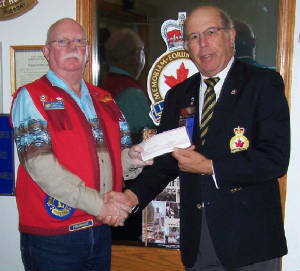 On October 02, 2012 Lion President Bob Ellingson presented Chris Schaper, president of the Royal Canadian Legion Branch No. 105, Olds with a cheque for $2,000.00. 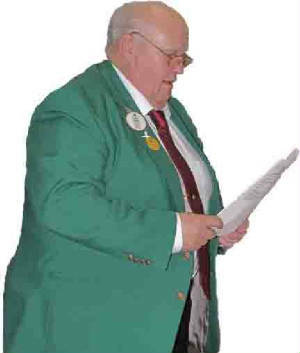 Wish deep regret we publish the news of the passing of one of our Charter members, Lion Willy Thomsen. With fondness we will remember him. October 08, 2011. The weather was perfect for cleaning our 4 mile section of Highway 2A south of Olds. We had 20 Lions members turn up and because of that we were able to complete the task in about an hour. The ditches were fairly clear of junk this year so our job went much faster than in previous years. Let's hope people are starting to become more conscious about litter. Following the highway cleanup of 2011 we were treated to an absolutely GREAT luch at the Hagerty's. Once again Fay (pictured above with Lion Pat Reed) showed us just what a great hostess she is. Thank you Fay and Bill!!! 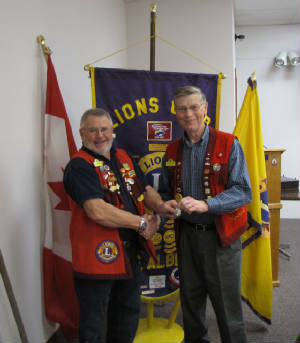 On January 04, 2011 we were honoured with a visitation from our District Governor, Lion John Goodrich. District Governor Goodrich gave a very interesting speech and outlined his goals for his term in office. Lion President Howard Wright presents District Governor John Goodrich with a cheque in the amount of $500.00 for the Canadian Guide Dogs. 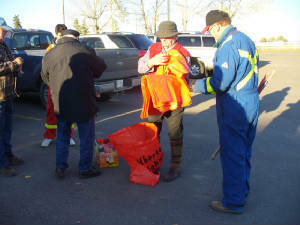 On November 12, 2010 the Olds Municipal Library held its Grand Opening for its new building. Built on the foundations of the olds library the new library is half again as large as the old one. The roof windows allow much sunlight into the building during the day which is most welcome during our winters. The building was designed by Group 2 and the construction was supervised by them as well. Because of their diligent work the building construction came in on schedule and on budget. The Olds Lions club contributed $80,000.00 towards the new library and its contribution led the way for others to follow. 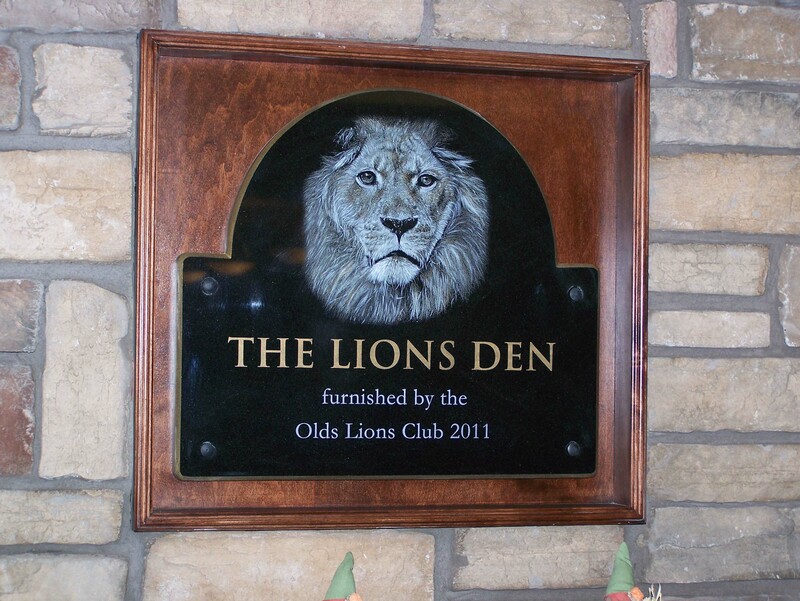 Because of our contribution the new video conferencing room in the library was named 'Lions Den' in honour of the club. Pictured here is Lion Bill Hagerty by the sign. The library board and library staff laid out an excellent lunch and program. A "Well Done" to everyone involved. Please visit our library web page. Lion Bill Hagerty stands between the video conference screen and the internet video screen. 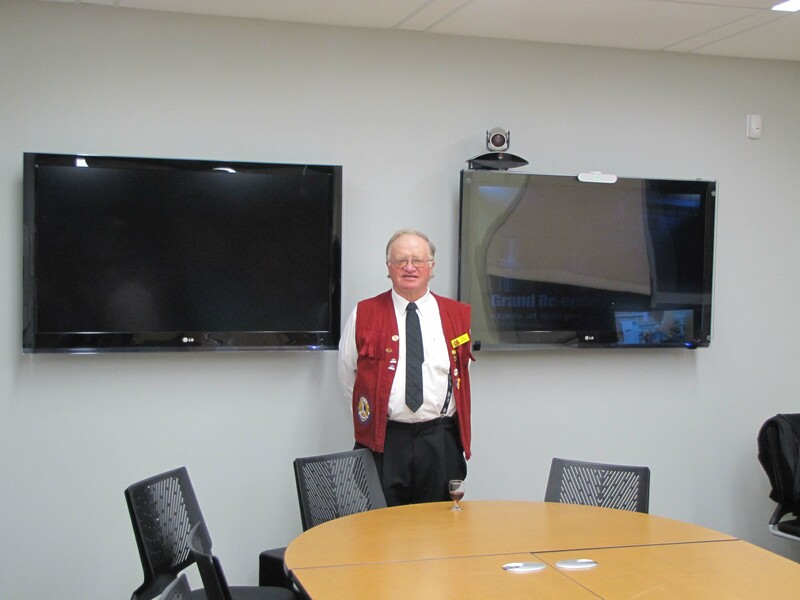 While the Grand Opening was taking place the village of Cremona public library staff was kind enough to connect their video conference room to ours to demonstrate how the future will look. The donor wall will be above the new fireplace. As the bricks and plaques have not yet arrived all donors were shown on posters. The Lions logo figures prominently in this display, as it will when the plaques do arrive. Lion President Howard Wright presents Past President Gil Connolley with his Club President Membership Growth Challenge 2009/2010 pin from Lions Club International. Well done Lion Gil. The award was much deserved! 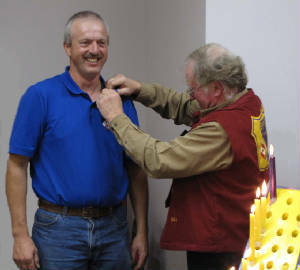 On October 19, 2010 the Olds Lions Club accepted Bob Ellingson into its ranks. 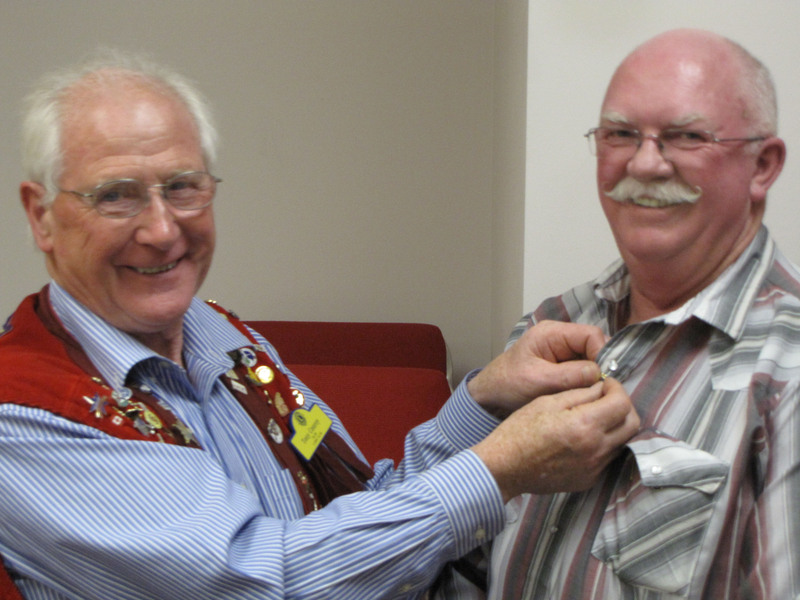 Here sponsor Lion Tony Conroy (on the left) pins Lion Bob with his lions lapel pin. We all wish Lion Bob a long and productive stay in our club. 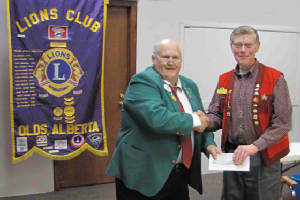 On Sept. 21, 2010 the Olds Lions Club received a new member. Beat Umbuehl was sponsored by Lion Bill Hagerty seen here giving Lion Beat his Lions pin. Congratulations Lion Beat. May your membership be long and fulfilling. 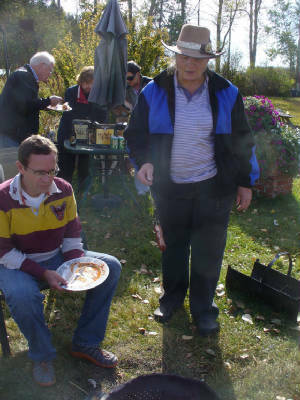 Six Lions clubs have joined together to produce a 2011 calendar. The proceeds of this calendar are to be given to the Mountain View Food Bank Association. Lions clubs from four counties are involved. 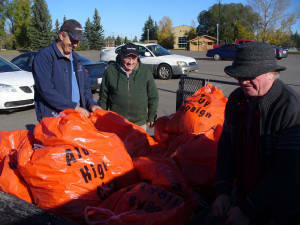 The Lions clubs are Bowden, Carstairs, Madden, Olds, Sundry and Torrington and represent the counties of Mountain View, Rocky View, Knee Hill and Red Deer. This is the first such co-operative project in the history of any of these clubs. It is hoped that it will be the start of a continuing endeavour. In mid-July we closed the ad sales portion of the project and sent the data base to our publisher. I am happy to report that the sales of ad space, date squares and calendars brought in a gross revenue of $9,200.00. We have yet to tally our final costs but we should know the net profit by the end of October. In September the six clubs met and decided to produce another calendar for 2012. Each club will provide four (4) photos for the new calendar. A special thanks to all Lion members who helped make this project a success and to those advertisers who supported us. 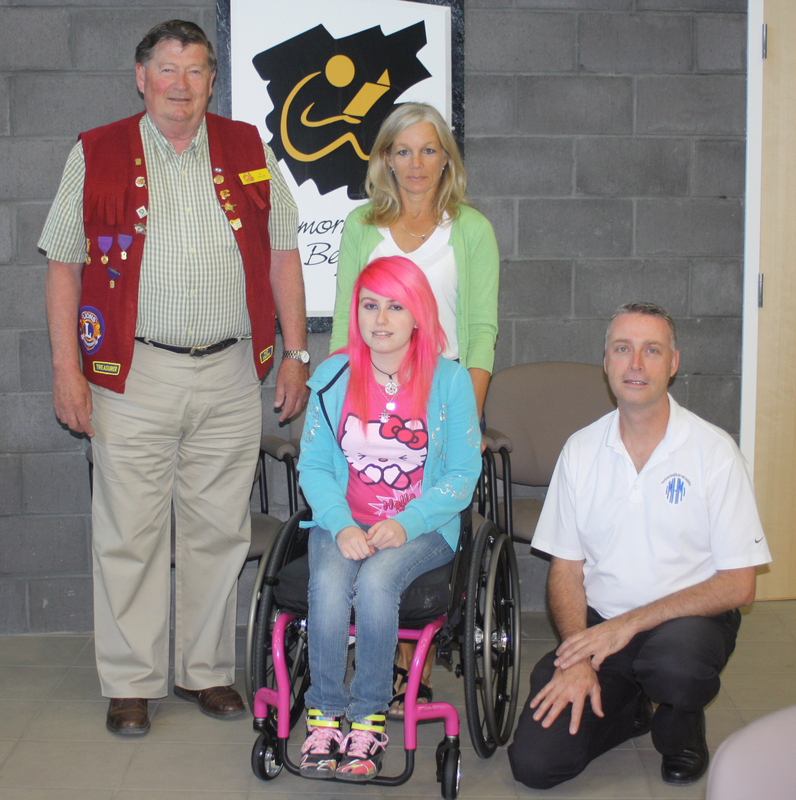 On May 17, 2010 the Olds Lions Club presented Arielle Phillips with a new wheelchair. The funding came to the Lions Club through the Charitable Gift Foundation as was from the Arnie J. Charbonneau Foundation. Our club was very happy to act as the holder of the funds to pay the manufacturer of the chair. Pictured here from the left are Alan Taylor, Sandy Arbuthnot, Arielle Phillips and Al Neary. The wheel chair was manufactured by Maximum Health Care & Mobility. Mr. Neary represented the company and demonstrated the many features of the wheelchair. The chair is only 15 pounds and is much easier for Arielle to handle that her old one was. 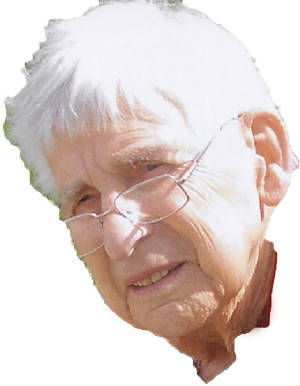 Sandy Arbuthnot is the person responsible for finding and arranging the funding. It was one of those days that you felt very good to be a Lion. 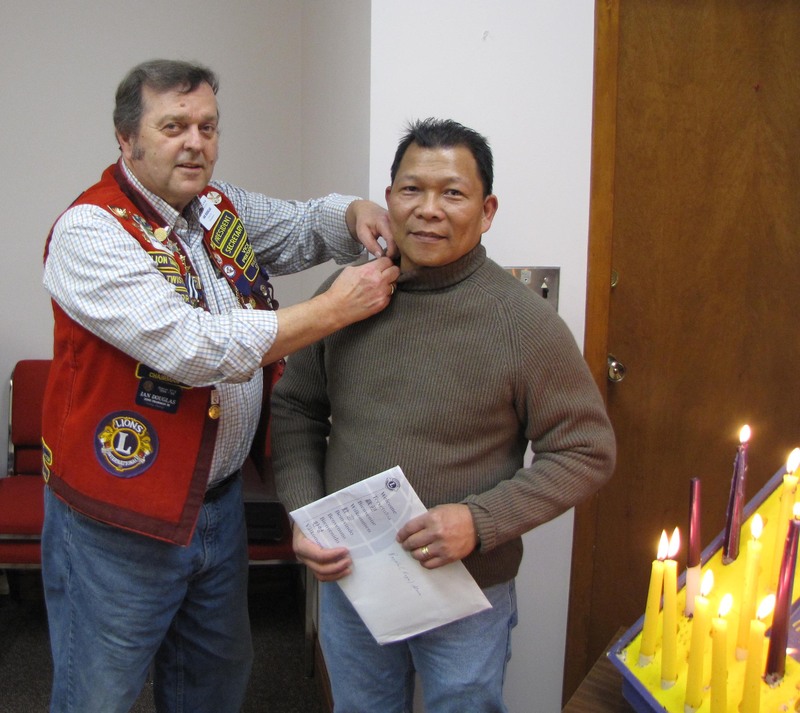 On February 02, 2010 Olds Lions welcomed their newest member Roger Alomo. Roger was sponsored by Lion Ian Douglas seen here pinning Roger's Lions Pin on his sweater. We wish Roger a long and happy membership in the Olds Lions Club. Welcome to the club Roger. 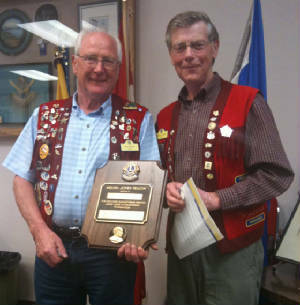 It was with great pleasure that the Olds Lions Club presented a Melvin Jones Fellowship award to Lion Tony Conroy on June 07, 2011. This award was a long time coming and much deserved.